Graduation Prayer - What Can Students Do? Public schools will soon be hosting graduation ceremonies for their students. In some communities, student speakers may want to express their faith or even offer a prayer from the podium. It is vital that students learn how their world is a better place because of Christianity's influence. The Declaration of Independence famously asserts that "all men are created equal and endowed by their Creator with certain inalienable rights." 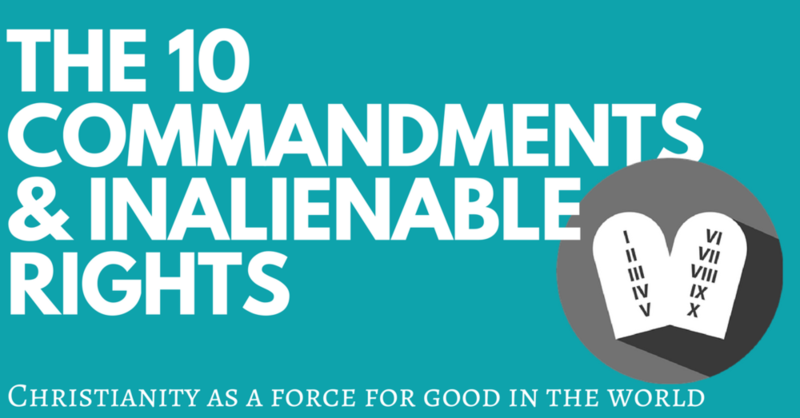 What isn't so well known is how Reformation thinkers, two hundred years before America's founding, saw the Ten Commandments as the basis for these rights. "While the First Table of the Decalogue anchored each person's religious rights...the Second Table anchored each person's natural social rights and correlative duties." Reformation thinkers understood the command, "you shall not murder," to also mean that people have the right not to be murdered - a right to self-defense, as well as a right to care for and protect life. Reformers saw, "You shall not steal," as affirming the right to own things--property rights. This also means that, in order to afford property, people have the right to be paid for their labor. "You shall not bear false witness" also means that everyone has the right to a good reputation and protection from slander and defamation. Reformers saw, "You shall not covet your neighbor's wife; and you shall not covet your neighbor's house..." to also mean that their household should be respected and protected by the government and from the government (as in, the Fourth Amendment's protection against unlawful search and seizure). "the ideas that the republic is formed by a covenant between the rulers and the people before God; that the foundation of this covenant is the law of God and nature; that the Decalogue is the best expression of this higher law...that violations of these rights and liberties or of the divine and natural laws that inform and empower them, are instances of tyranny that must trigger organized constitutional resistance." The Pilgrims were Calvinists who carried these ideas to America which ultimately led to the Founding Fathers' thinking about ordered liberty and revolution against tyranny. This history lesson can be taught in any class that addresses subjects such as the ancient Israelites, the Reformation, the Puritans, the Pilgrims, America's founding, the Declaration of Independence, the Constitution, and the Bill of Rights. In North Carolina, the Cumberland County Board of Education recently voted 6-3 to keep the Ten Commandments posted in some of its schools. The Ten Commandments have been part of "Freedom Walls" which display a variety of historical documents including Magna Carta, the Mayflower Compact, and the Declaration of Independence. Sixth Grade Civics & Government - "The student will know: The basic tenets of major world religions and philosophies such as ...Judaism ...Christianity...; Examples of how ...Judaism... Christianity... transformed various societies." High School World History - "Students will know: How written laws such as ...the Ten Commandments reinforced the belief that government had a responsibility for what behaviors were acceptable in a society and the consequences of unacceptable behaviors." High School American History 1 - "Student will know: How the Protestant Reformation impacted European exploration and settlement of North America. How the social and religious movements (e.g., Great Awakening) impacted religions in the colonies, family and educational practices. How and to what extent specific factors such as ...religion... helped lead to the political, social and economic development of North American colonies." Symbolism has its place. But symbolism is only valuable when those who see it understand the substance behind it. Essay: Calvinist Contributions to Freedom in Early Modern Europe, John Witte, Jr. It is important when teaching students about a religion that you remain objective. The best way to achieve this is by attribution. For example, when introducing a lesson on the Resurrection, explain to students that it is from Luke's account of the life of Jesus. Use phrases such as, "Luke wrote that...," or "The Bible says...". When referring to beliefs about the story, use phrases such as "Christians believe...," or "Martin Luther King, Jr. believed..."
Your goal should be to introduce students to the story and help them understand the influence it has had on history, literature, art, and music. The lesson is not designed to prove the story is true, nor question whether the story is accurate. According to the U.S. Department of Education's guidelines on students' religious liberties, your students have the right to freely express themselves regarding their personal beliefs. However, as moderator of a class discussion on this topic, you should emphasize that every student be respectful regarding their classmates' comments. No student should be made to feel excluded for expressing belief or disbelief in the story. As a teacher, you can be confident in addressing this topic. This story has had significant influence in world history and should be understood as such. You are not teaching Sunday school; you are teaching a subject that has impacted history, social movements, politics, literature, art, and music. You can request a copy of our Easter Lesson Plan for Public Schools by CLICKING HERE. It adapts Luke 22-24 into a textbook-style lesson with pictures, vocabulary, culture facts, and discussion questions. CLICK HERE to order our EASTER CARD, Bunny Goes to School, for your teacher. CLICK HERE to share your story about Easter in your public schools. St. Patrick's Day is coming up and I'm sure your schools are going to be recognizing it with green and shamrocks and leprechauns. That's always fun. But I would encourage you to also teach your children and your students the real story of who Patrick was. "[A]s the Roman Empire fell, as all through Europe matted, unwashed barbarians descended on the Roman cities, looting artifacts and burning books, the Irish, who were just learning to read and write, took up the great labor of copying all of western literature-everything they could lay their hands on." "These scribes then served as conduits through which the Greco-Roman and Judeo-Christian cultures were transmitted to the tribes of Europe, newly settled amid the rubble and ruined vineyards of the civilization they had overwhelmed. Without this Service of the Scribes, everything that happened subsequently would have been unthinkable." "Without the Mission of the Irish Monks, who single-handedly re-founded European civilization throughout the continent in the bays and valleys of their exile, the world that came after them would have been an entirely different one--a world without books. And our own world would never have come to be." Below are some resources for you to use in your home or in your classroom. Here’s a 2-minute video from the History Channel you can show in class. Each year since 1993, the President declares January 16th to be “Religious Freedom Day,” and calls upon Americans to “observe this day through appropriate events and activities in homes, schools, and places of worship.” It’s not the day you get to have religious freedom! It’s a day to celebrate the freedom we have year ‘round. It’s the anniversary of the passage, in 1786, of the Virginia Statute on Religious Freedom. Thomas Jefferson drafted the legislation and considered it one of his greatest achievements. It protected the rights of people to express their religious beliefs without suffering discrimination and it influenced how the First Amendment was written just three years later. It’s a great opportunity for students to learn a civics lesson about their religious freedom at school. Ask your school to recognize the Day, and have teachers give students a list of their freedoms to express their faith in class. For more information on Religious Freedom Day and the list of freedoms students have, click on the link below.